Delight your guests with delicate folding fans decorated with a sprinkle of gold dots. They will add a classy finish to your summer occasion when personalized with a name and date. Add a beautiful touch to your event tables with these pretty white fans decorated with a theme of delicate gold dots. The fans are fashioned from a light colored wood and feature a stunning intricately carved design. They have a collapsible ribbing structure with an outstretched silk fan attached. Folds into a compact shape and looks stunning when open! The personalization of the fan is it printed or is it labels? 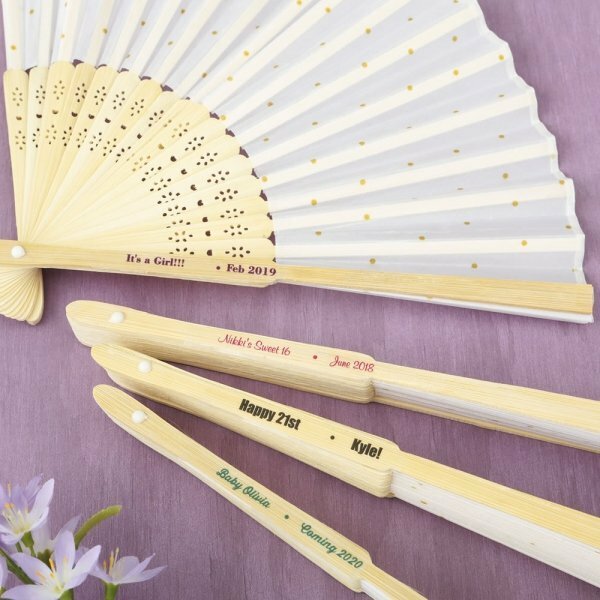 The Personalized Occasions Gold Dot Silk Folding Fan Favor uses a personalized clear sticker showcasing your name and the date of your special event. Stickers come on easy peel sheets sized at 8.5" x 11" and assembly is required. Hello, I need to place an order of 50 hand fans-- can all 50 be personalized? Yes, the Personalized Occasions Gold Dot Silk Folding Fan Favor can be personalized. You can personalize the font, font color and add 2 text lines.